Law School stories at Techdirt. stories filed under: "law school"
About a month ago I wrote about James Boyle and Jennifer Jenkins of the Center of the Study of the Public Domain at Duke Law School releasing a free download of an Intellectual Property Statutory Supplement (which normally big publishers try to sell for around $50). As noted, this was a kickoff for an even bigger project, an open coursebook in intellectual property. That Open Intellectual Property Casebook is now available. You can download the whole thing for free. If you want a nice printed copy, it'll currently run about $24 on Amazon -- which is about $135 less than other IP case books. The entire book weighs in at nearly 800 pages, so there's a lot in there if you felt like delving into a variety of topics around copyright, trademark and patent law -- including specific efforts by Congress around those laws and the way that the courts have interpreted them. Partly, we do it because we think the price of legal casebooks and materials is obscene. Law students, who are already facing large debt burdens, are required to buy casebooks that cost $150–$200, and “statutory supplements” that consist mainly of unedited, public domain, Federal statutes for $40 or $50. The total textbook bill for a year can be over $1500. This is not a criticism of casebook authors, but rather of the casebook publishing system. We know well that putting together a casebook is a lot of work and can represent considerable scholarship and pedagogic innovation. We just put together this one and we are proud of it. But we think that the cost is disproportionate and that the benefit flows disproportionately to conventional legal publishers. Some of those costs might have been more justifiable when we did not have mechanisms for free worldwide and almost costless distribution. Some might have been justifiable when we did not have fast, cheap and accurate print on demand services. Now we have both. Legal education is already expensive; we want to play a small part in diminishing the costs of the materials involved. Our point is not only that the current casebook is vastly too expensive, it is also awkward, inflexible, lacking visual stimulus, incapable of customization and hard to preview and search on the open web. Casebooks do not respond well to the different needs of different professors. Students cannot easily be given free, searchable digital access to all the materials, on all their devices, anywhere, access that does not go away when the course—or the publisher—ends. We can do that. There are also lots of people outside of law school, or outside this country, who would like to know more about American law—just as there are people outside of computer science who want to know about artificial intelligence. Free is a good price-point for them. Customizable is a good form. This book is merely a beta-test version, but it is an example of what can be done. In case you're wondering, while the statutory supplement was available on a CC: BY license (requires just attribution), this casebook is under a CC: BY-NC-SA license. The key differences: the former can be resold commercially while the latter has a block on commercial uses. It also has a "share alike" requirement. While I'm a huge fan of Creative Commons, I've been critical of its licenses that include the non-commercial restriction and believe there are strong reasons to remove them, in part because of a perception and branding problem that people have, which potentially do more harm than good to the Creative Commons brand. Many people believe that all CC licenses are "non-commercial" which has actually limited those who wish to use them to encourage commercial use. Separately, the definition of "non-commercial" can be pretty vague (though, to its credit, Creative Commons has worked hard to clarify). Editor’s note: we interpret this to mean “providing the material above cost.” Digital cost is zero. You are free to reproduce the material in paper form and charge a fee to cover copying costs, but nothing more. This applies both to commercial and non commercial entities. DailyDirt: So You Want To Be A Lawyer..? Lawyers often get a bad rap -- sometimes rightfully so. But does the entire profession really deserve endless lawyer jokes and derision? Despite the hate, thousands of people still study to become lawyers, racking up a pretty hefty amount of student debt in the process. Here are just a few interesting links for those of you who might be considering (or going through) this educational process. Should You Brag About Your Law School Grades On Facebook? In a way, I’m surprised we don’t have more stories about people posting their grades on social media sites. The kids are already using Facebook and Twitter as a running diary of their lives, so you’d expect there to be more instances where people throw their law school transcripts up on the internet. In fact, let me ask the question this way: why wouldn’t you post your grades on Facebook? They’re clearly important to you. If you did well, you can brag about them just as surely as one of your friends is bragging about the exploits of their kids or dogs. If you did poorly, you can seek the solace of friends who you don’t actually like well enough to have a beer with. Why wouldn’t you post them? The obvious answers seem painfully old-timey. “It’s in poor taste to brag about your grades.” “Your transcript should be private.” “You got an ‘A’? Go f*** yourself.” These are the thoughts of a previous generation. For the Facebook generation… I mean, have you seen what people post? This is nothing. A law student decided to post his solid grades on Facebook. I bet you can guess what school we’re talking about. Let’s just say that it’s a school that seems to admit students who like to draw attention to themselves when things are going well by subtly upturning their collars…. It’s not really “bragging” if you got Bs. He’s only a first year. “Deprive non-law school friend of updates about my life” is the new killing it. Again, this wouldn’t be something I would do, but this is how people use social media. It’s UVA! I bet this isn’t even the most “look at how special I am” Facebook post by a UVA Law student since I started writing this story. 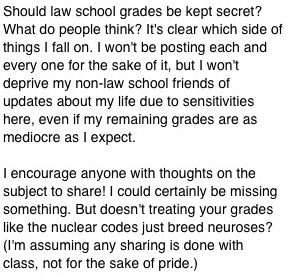 I reached out to the guy (via Facebook) who posted his grades, but he has not yet responded. I assume he’s somewhere trying to figure out why so many people care that he posted his grades on Facebook while simultaneously firm in his belief that his 1L grades were an appropriate starting point for a public Facebook discussion. It’s the world we live in. In the battle between propriety and Facebook, Facebook wins. Facebook won. People better get used to seeing this kind of thing, at least from 1Ls who don’t yet know any better. You may remember, in the wake of the SOPA/PIPA fight that Paramount Pictures (a Viacom company) reached out to a bunch of top law schools, asking if it could send its "Worldwide VP of Content Protection and Outreach" (seriously), Albert Perry, to teach the students about the evils of "content theft." It appears that Brooklyn Law School took them up on the offer, and Brooklyn Law school prof Derek Bambauer wrote up some great notes on the session. The law school also had professor Jason Mazzone (author of Copyfraud and this month's Techdirt book club author) provide a "response" to Perry. Honestly, the talking points won't surprise anyone who pays attention to this stuff. Perry argues that Hollywood is suffering massively from "content theft" and that something must be done. Mazzone, thankfully, points out that Perry is being disingenuous in using the word "theft," when it's not theft under the law or in reality. Using the word "theft" unfairly biases the discussion and ignores both the realities of copyright, and the fact that copyright is not absolute. Perry, however, can't let go of the term, apparently. You could sum of Perry's talk by basically saying "well, the big Hollywood studios are suffering, and it's everyone's fault but our own." While he said he didn’t want to get into copyright math, Perry noted that the number of films released by the six major motion picture studios has dropped from 204 in 2006 to 134 in 2011.... He suggested that online infringement affects ancillary (post-box office) revenues, which isn’t captured in rosy reports of ticket sales. Perry said he doesn’t believe that infringement will wipe out content – rather, it will shift it. We’ll see more small-budget or amateur films, and fewer major studio films. These movies, he suggested, are the iconic ones that people remember and reference, so piracy may have an important cultural impact. Of course, there are a few problems in these claims. While the big six studios may have made fewer movies, many more movies were made overall in the global economy. Just looking at the US, while the major studios released 204 movies in 2006, indies released 390. His number is off in 2011. It was actually 141 movies released by the major studios... but indies increased their release numbers to 469. So, total movies released actually grew from 2006 until 2011. That certainly suggests that everyone else in the market is figuring out how to adapt. Why should we be concerned about six companies that are unwilling to adapt? And, is that ever condescending and insulting to suggest that indie movies can't possibly have the "cultural impact" of a movie like Jack and Jill. Perry also praised totally one-sided and misleading "education campaigns" that copyright maximalist organizations like the Copyright Alliance have been able to get into schools, ignoring things like fair use (it was also noted that Perry ignored fair use in his initial statements). It's really silly that schools are accepting industry propaganda like that to teach kids. Thankfully, more accurate alternatives are being created. The discussion was impressively thoughtful and civil. The students evinced skepticism about the movie industry’s good faith and bona fides, particularly given the drafting of SOPA / PROTECT IP, and also given the recording industry’s history of suing its users. Perry pointed out that Paramount is trying hard to make content available widely, cheaply, and easily, and that the only other way of altering the reward calculus to users is to engage in enforcement against end consumers, which no one likes. He was repeatedly puzzled by the attitude of law students that infringement isn’t a big deal (since it’s unlawful), particularly when this attitude is justified by reference to movie industry profits. In the end, while it was civil, it sounds like the same old story of Hollywood just not understanding. The profits of six organizations is of little concern to the wider social benefit, and Hollywood cannot show that there's any wider harm (because there is no such proof). Thankfully, it appears that the students (and professors) at Brooklyn Law get this important point. Over the years, we've repeatedly identified Louis Vuitton as one of the biggest trademark bullies around. The company seeks to abuse trademark law to stifle free speech all the time. Anything involving any kind of parody of LV's trademark seems to get a cease and desist. A few examples: LV sued Hyundai because of a silly commercial which (very, very briefly) shows a basketball with a design kinda like the LV monogram pattern in an ad joking about what a more "luxury" world would look like. Even more troubling has been LV's decisions to go after artists commenting on consumerist culture. There was the successful move to shut down an art exhibit by a student who made locust sculptures out of counterfeit LV bags. Then, famously, LV went hard after artist Nadia Plesner who made some t-shirts to benefit victims of the genocide in Darfur. She had made some t-shirts showing a young Darfur victim carrying a bag that had a similar (but not exact) pattern to LV's bag pattern. In all of these cases, LV is clearly abusing both the intent and letter of trademark law to stifle commentary or parody, rather than any real confusion (or even dilution). This egregious action is not only a serious willful infringement and knowingly dilutes the LV Trademarks, but also may mislead others into thinking that this type of unlawful activity is somehow "legal" or constitutes "fair use" because the Penn Intellectual Property Group is sponsoring a seminar on fashion law and "must be experts." People seeing the invitation/poster may believe that Louis Vuitton either sponsored the seminar or was otherwise involved, and approved the misuse of its trademarks in this manner. I would have thought the Penn Intellectual Property Group, and its faculty advisors, would understand the basics of intellectual property law and know better than to infringe and dilute the famous trademarks of fashion brands, including the LV Trademarks, for a symposium on fashion law. You assert that the clever artwork parody that appears on the poster and invitation is a "serious willful infringement." However, to constitute trademark infringement under the Lanham Act, PIPG has to be using a trademark in interstate commerce, which is substantially similar to Louis Vuitton's mark(s), and which is likely to cause confusion between Louis Vuitton's luxury apparel goods and PIPG's educational conference among the relevant audience. First, I don't believe that PIPG's artwork parody was adopted as, or is being used as, a trademark to identify any goods and services. It is artwork on a poster to supplement text, designed to evoke some of the very issues to be discussed at the conference, including the importance of intellectual property rights to fashion companies.... Second, although you don't cite the actual federal trademark registration that you assert protect your marks, I doubt any of them are registered in Class 41 to cover educational symposia in intellectual property law issues. There is no substantial similarity between the goods identified by Louis Vuitton's marks and the PIPG educational symposium. Third, there is no likelihood of confusion possible here. 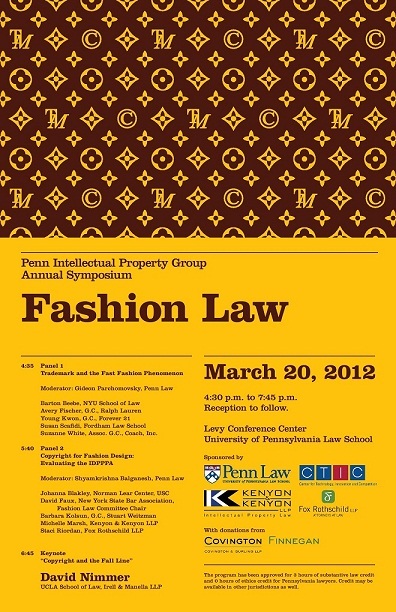 The lawyers, law students, and fashion industry executives who will attend the symposium certainly are unlikely to think that Louis Vuitton is organizing the conference; the poster clearly says that PIPG has organized the event, with support from Penn Law and a number of nationally-known law firms. The artwork on the poster and invitation does not constitute trademark infringement. There's a bit more in the response letter, including UPenn's lawyer inviting LV's lawyer to attend the event, and asking him to introduce himself. One would hope that LV's counsel will have the good sense to let this matter drop, but it would be kind of fun to see LV get smacked down in court for yet another case of trademark bullying. On Friday, we wrote about reports of Paramount Pictures sending overnight letters to a variety of universities, asking to come speak to their students about the whole SOPA/PIPA debate, and why they're all "content thieves," before asking for the students' thoughts on what Paramount should do. The whole thing seemed pretty sketchy. Either way, we've been getting more details on the letter, and have now seen three different copies of the letter -- with one copy (with identifying info redacted) embedded below. Separately, we've seen that the letters went to law schools -- and it appears that Paramount only chose to target some of the bigger name law schools. Basically, it looks like Paramount went through the top law school rankings and just sent the letter to an arbitrary number at the top. I'm curious what the reasoning is here. Why pick just law schools? And why just a few of the big names? And, if the real goal is to understand what happened with SOPA/PIPA... why target law schools at all? Those aren't the students who were heavily involved in all of this. It seems like a transparent attempt to try to convince the next generation of lawyers to come help them try to cripple the internet, rather than work towards advancing innovation. We recently wrote about how the Thomas M. Cooley Law School, whose sole actual claim to fame appears to be that it takes on more students than any other law school, was suing some online critics. It had actually filed two lawsuits, one was against some online critics, and the other was against a law firm that had clearly been sniffing around some Cooley practices. Well, now the other shoe has dropped and, as ShellMG points out, that same law firm has sued Cooley in a class action lawsuit, claiming that the school posts false claims about its postgraduate employment rates. This is, clearly, what Cooley was trying to stave off with its original lawsuit, since in its lawsuit against the Kurzon Strauss law firm, it highlighted a message posted to a legal board asking students to come forward with information about Cooley's employment stats. Of course, the fact that Cooley sued first (with, as many people pointed out, lawyers who graduated from other schools) kind of makes you wonder what the school is hiding. That is, rather than wait to see if the law firm actually had anything, Cooley filed what could be described as a SLAPP suit, in that it appears it sought to stop the law firm from actually getting its message out to former students. It certainly makes for an interesting defamation claim. Can you accuse a class action law firm of defamation for reaching out to find people who had a bad experience? You have to wonder what the Brooklyn Law School is teaching its students about due process, since it recently sent an email to all students saying that after receiving complaints from copyright holders about file sharing movies and TV shows, it was going to associate the IP addresses with names and hand them over to the copyright holders. Of course, this is based solely on an IP address, which is not particularly accurate or reliable as a unique identifier of an individual, so what Brooklyn Law School is basically telling its students is that it doesn't care if they falsely accuse them of file sharing, and the students should work it out with someone else. Not exactly the sort of lesson that you would think a law school wants to teach its students. Update: Ah, the power of a little attention. Apparently the school has already backed down and said that it will only do what is legally required by the DMCA, which does not include simply handing over names.